Going light can work wonders, and a little security can stoke the fire when ambition outpaces the setting sun. 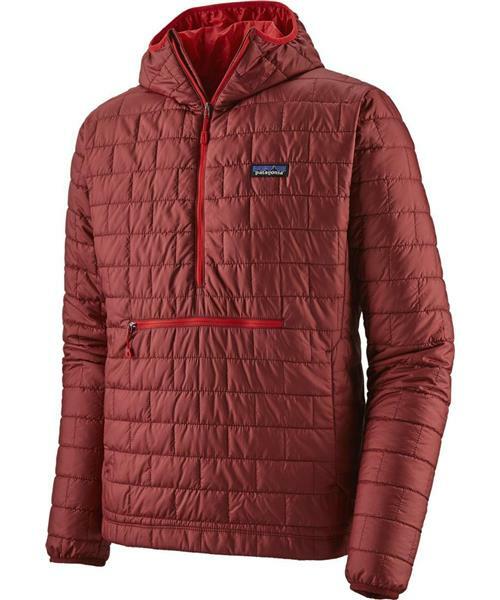 For stuck-in-the-dark belays and minimalist bivouacs, Patagonia's updated Nano Puff® Bivy Pullover is light, windproof, warm and has the pared-down features that help shift the odds in your favor. The water-repellent, compressible 60 g PrimaLoft® Gold Insulation Eco—now with 55% post-consumer recycled content, and still the most thermally efficient synthetic insulation available—has a superb warmth-to-weight ratio and maintains 98% of its warmth, even when wet. The interlocking fibers of the lightweight, 100% recycled polyester Pertex Quantum® ECO shell and liner fabrics block wind, shed moisture and enhance the DWR (durable water repellent) performance. When the going gets cold(er), the kangaroo-style handwarmer pocket and a close-fitting, under-helmet hood with elastic binding bumps up the comfort level. The zippered drop-in torso pocket doubles as a stuffsack with a reinforced carabiner clip-in loop. With a deep venting center-front zipper, elastic bound cuffs and a drawcord-adjustable hem.